Springtime has come, and many Georgia homeowners are planning on making big changes to their kitchens. This versatile room serves as the central hub of your property, and often requires the most in-depth planning to ensure a high-quality result. Now may be the perfect time to update your kitchen cabinets, creating a fresh new look that infuses energy into your design. In order to achieve the best look, though, you’ll need to coordinate your cabinets with the rest of your surfaces. This is one area where our home remodeling contractors can make a major difference. Detail Design & Remodeling of Atlanta is here to serve as your cabinet refacing pros, delivering complete home remodeling services to create a result that will impress you on a daily basis. Our old-world approach to craftsmanship and quality combined with our customer-first approach ensures that each project we work on is well worth the investment. Today, we’ll begin to highlight a few of the most popular materials utilized for countertops. Remember that our cabinet refacing pros can help to create an ideal matchup with your other surfaces, and be sure to schedule your free in-home consultation with us when you are ready! There are dozens of options available to provide a stylish surface for all of your kitchen activities. It’s important to find the right fit for your design preferences. Need assistance in finding the right finish for your kitchen? Detail Design & Remodeling is here to help! Plastic and artificial everything became popular in the late 1960s, resulting in modern laminate resins that are used for floors, countertops, and more. Today, homeowners can rely on the convenience and affordability of laminate to cover their counters with quality. When installed correctly, laminate countertops deliver a functional level of beauty and protection. Laminate is adaptable and affordable, but may not provide the best protection from cuts and dents. When the right product is installed, homeowners can benefit from years of cost-effective use. You can choose from a huge variety of colors and finishes when it comes to laminate, so be sure to browse with your local remodeling company to find the best results. Many people have heard of this material as a medium for carving, but certain types of soapstone can rely on less talc for a hard and rigid surface. Soapstone countertops provide a dark, rich finish that is treated to resist knicks and scratches. If your surface does sustain damage, it can typically be remedied with minor repairs. Homeowners can also rely on materials such as marble and limestone to create a natural look that provides the right feel for any design. Marble countertops can provide a classic, rich beauty in contrasting white or black finishes. These materials come in a wide range of textures and colors, so be sure to do your research before investing in both your cabinets and counters. Countertops are now made of a wide range of materials, but few manage to sparkle and shine like glass. This material is known to be extremely strong and rigid, relying on a wide range of color options to match every kitchen. You can also change up the size of the glass shards to personalize the look of your countertops. While created to be durable, glass countertops may not provide the right level of protection for those worried about cracking or scratching their surfaces. Glass is rated to protect against stains and cuts, but the level of quality will depend on the manufacturer. You can choose from blue, brown, red, yellow, white, black, green, clear, and more to enhance your fresh cabinets. While this material feels better left to your favorite food vendors, the truth is that stainless steel countertops can deliver an ideal shine with minimal maintenance. Steel is very cost-effective as a countertop material, providing complete protection that keeps your surfaces free from gouges and stains. Stainless steel countertops rely on a wood core for added affordability. Once installed, you can rely on this material without having to worry about upkeep. If you’re ready to get started on your kitchen remodel, be sure to call our contractors to see how we can provide serious longevity at an ideal price. Steel does not come in a plethora of colors, so be sure you plan your cabinet refacing accordingly! 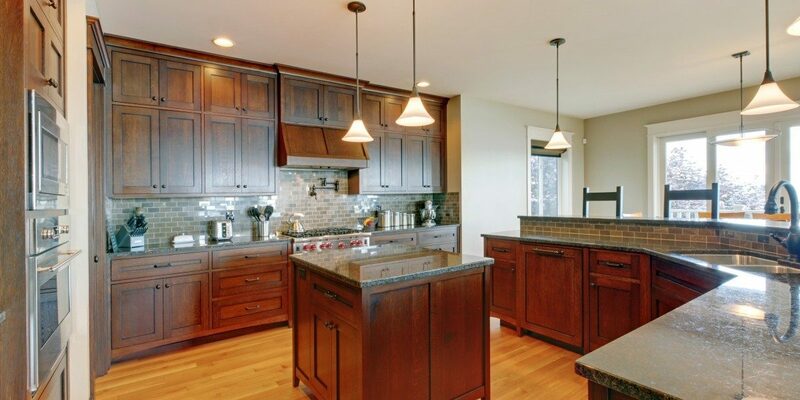 Now may be the perfect time for you to upgrade your kitchen and enjoy years of comfort and convenience. Next time, we will continue this topic by highlighting a few more materials that prove perfect for your countertops. If you’re ready to get started, then our cabinet refacing pros in Atlanta are here and ready to help! We rely on old-world craftsmanship to deliver cost-effective results that you will love. Contact us today to learn about our cabinet refacing services, and be sure to discuss your home remodel for a free estimate!